Wedding invitations and cards - In-person sales for Massachusetts and Rhode Island customers. The Invitation Depot. Serving Rhode Island, Massachusetts, and Connecticut customers at our Attleboro, MA boutique. Please note, due to the time and attention required for each customer's consultation, an appointment is necessary if you wish to visit our boutique. We have many invitation albums for you to choose from. We offer products by Carlson Craft, Kleinfeld paper, Minted LLC, Janice Paper, and Printswell. Call or request an appointment to see and feel the invitations we carry - with our extensive selection, we're confident you'll find something you like. 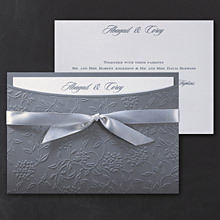 We also sell invitations online in addition to our Massachusetts boutique. We carry an extensive selection of wedding invitations, bridal shower invitations, save the date cards, save the date magnets, plus many more. We have many albums and catalogs for you to browse through - nothing like seeing and feeling in person the invitations to get a feeling for the quality of the product. Choose from the classic look to the more modern. Your young child or baby's special occasion is always a precious time. Delight family and friends with an invitation that sets the right tone for the celebration. We have many baby shower invitations, baptism and christening, adoption announcements, and birthday invitations, for you to choose from. 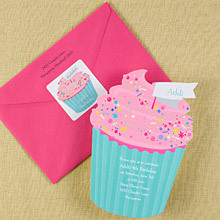 Get the party started with a fabulous birthday party invitation or card. 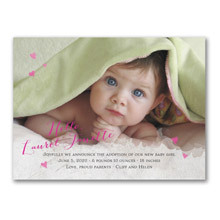 We carry birthday invitations for babies, children, teenagers, sweet sixteen, and adults. No matter if you are celebrating your baby's first birthday, your teenager's sweet sixteen, a quinceanera, or a 40 year old birthday, we have the right card for you. 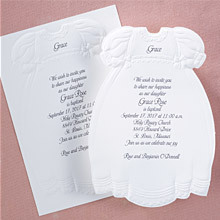 We have many unique and elegant invitations for all religious occasions - baptism & christening, bar and bat Mitzvah, and first communion.